The next-generation 2019 Ram 1500 has received a lot of great reviews since its debut at the 2018 Detroit Auto Show. Not only has it been mentioned by WardsAuto twice, once for the “Best Interiors List”, and again for the “2019 Best Engine” with the V6 with eTorque powertrain, but it’s also the safest Ram truck to date, with an overall good rating from the Insurance Institute for Highway Safety. 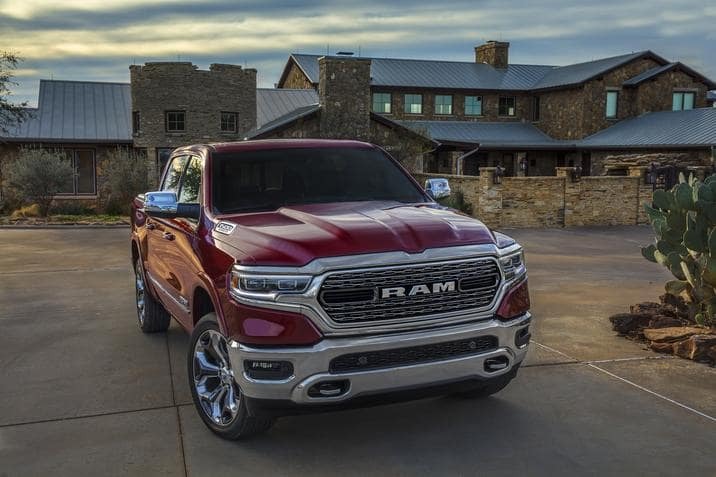 The 2019 Ram 1500 also racks up awards, its most recent from the Rocky Mountain Automotive Press Association. What is the Rocky Mountain Automotive Press Association? The Rocky Mountain Automotive Press Association (RMAP) holds the Rocky Mountain Vehicle of the Year awards every year, marking 2019 as the 13th celebration. With a goal to recognize trucks that are all-new or significantly revised for the 2019 model year, not all vehicles make the cut. RMAP represents automotive journalists from Colorado, Utah, Wyoming, New Mexico, and Arizona, able to exchange information between automakers and journalists to help consumers make informed decisions. Well, the next-generation 2019 Ram 1500 is definitely all-new, and the truck was made available to RMAP members for a test drive. No reason for any more suspense, the 2019 Ram 1500 was named “Truck of the Year” by RMAP. “This year, competition for Truck of the Year with the Rocky Mountain Automotive Press was very intense and exciting with three very worthy trucks making the final vote…After a vote from all the members of RMAP, it was a clear choice for the new Ram 1500 to be awarded Truck of the Year in the Denver region.” – Craig Conover, President of RMAP. RMAP chooses the “Truck of the Year” based on a number of qualities, including performance, fuel economy, value, and vehicle features. Then, their vehicle nominating committee narrows it down to three finalists. Ram pulled through with flying colors, especially thanks to their WardsAuto-crowned V6 engine. “The 2019 Ram 1500 with eTorque mild hybrid system is the benchmark for efficiency and durability with a high level of technology and luxury unexpected in a pickup truck…Recognition from the Rocky Mountain Automotive Press Association further solidifies our efforts in the design, engineering and manufacturing of the Ram 1500.” – Reid Bigland, Head of Ram Brand. This isn’t the first award Ram has won since its release, nor is it the first time it’s been called the “Best” anything. U.S. News & World Report, another well-respecting publication, named the Ram 1500 in their “Most High-Tech Features for the Money” list. A lot of this came down to the new available Uconnect infotainment system with support for Apple CarPlay and Android Auto, 12-inch touchscreen, a 360-degree Surround View Camera system that provides a birds-eye view of the vehicle, and Harman Kardon audio system with 19 speakers and 10-inch subwoofer. Looking for that “Best of” title? Ever hear of the Greater Atlanta Automotive Media Association and the Family Car Challenge? It’s exactly what it sounds like, and the people of the Greater Atlanta Automotive Media Association (GAAMA) named the 2019 Ram 1500 as one of the best family vehicles, alongside the Chrysler Pacifica minivan and Chrysler Pacifica Hybrid. To be fair, it was the “Best Family Pickup Truck” award, but it’s surprising enough that the new 2019 Ram 1500 light duty pickup truck is considered a family car. What more could a consumer ask for? Want to take the 2019 Ram 1500 for a test drive? Live in Brickell? Make it a Brickell Ram! Check it out at Aventura Chrysler Jeep Dodge Ram.